Michelle McKinney Hammond, bestselling author of The Last Ten Percent, pens her second novel and explores the heartache that can come when women try to play God in their own lives. "Hope deferred makes the heart sick." After seven years as a counselor, the once idealistic Tamara Roberts has absorbed so much of the loss, doubts, and trials of her clients that she begins to question how God can let so much hurt happen in the lives of good people. Corinne Collins' husband, a respected religious leader, is unfaithful with another man; Lydia Deveraux tries to take matters into her own hands to settle the score between her and her famous but absent producer husband; Jamilah, Tamara's best friend, is trying to save a young girl neglected by her mother. In contrast, Felicia Sample (featured in The Last Ten Percent) is married, saved, and feeling blessed after a past of indecision and mistakes. 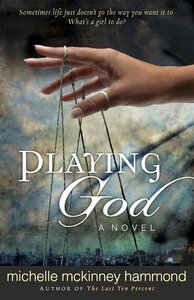 This riveting novel with intersecting story lines will remind readers that God is loving, all-knowing, merciful, and the One completely in control-if only we'll believe and wait for His victory.